Portable Shelters are fast becoming one of the most popular storage solutions for suburban and rural home owners in the United States. They provide a simple, fast and economical soluation for housing just about any hobby need, from boats to RV’s, cars, trailers, trucks, motor cycles etc. For the most part they stand up well in the snow particularly the round top models and they all have UV sun protection of some level built into the fabric. You have purchased your new shelter and it has arrived to your home. So what now? Well first things first, before you get too excited with the adventure of building your base camp like structure, you should retrieve the manufactures assembly instructions form the box and go get a nice cup of coffee. I cannot not emphasise enough how important it is to simply read and understand the instructions before you start. Of course this can be a bit laborious but if you give it the time it needs, the whole assembly process will be a breeze and you will feel in control and enjoy the task with a happy sense of achievement at the end. Most of these portable shelters are designed very much for the DIY minded person. After reading the instructions you will need to identify the complete inventory. This is usually a process of elimination. Some parts will seem obvious and others more obscure, but don’t give up just yet…! Take your fabric and doors and store them off to the side and out of the way first without opening them up, just identify what is what and try to visualize where they will go as per your instructions. You are now left with all the hardware. Before going through the hardware, you must decide exactly where you are going to place your shelter. You will do well to place the hardware outside the allocated space for your shelter and have everything at hand but not in your way when you go to build it. You will have to measure the footprint and set it out on your proposed spot. It is important to do this to get a clear idea how the shed will fit on the site. Can you access all sides of it if you need to? While it may be ok to place a gable of your shelter next a wall of your house or boundary wall, it is not advisable to place a sidewall of the shelter too close to another wall as during fall or winter you may need to remove leaves or snow, and also to allow the rain run off to drain into the ground. If it is too close to a boundary wall the rain water may run back into the floor of your shed. Regarding the base; the ideal base will be a concrete pad made to measure for your shelter but this can add significant cost to the whole job. You can easily set a shelter on a grass or dirt surface. Some folk lay them on a gravel base. You could consider laying 2×4 or 2×6 timber flat on the ground around the perimeter to allow the uprights to sit on an even and level surface. Take a little time setting out timbers and bed them level. Gravel is a cheap solution and ideal to drain off any water accumulating on the base and will keep your contents dry. Also if your shelter is a temporary solution you can easily remove gravel later and relocate it to another part of your property. Key to assembly is first identifying all the frame parts and placing them along the perimeter of the base, roughly where they will go. While one person could assembly the roof structure on the ground alone, it will make the whole job a lot easier if there are two or more people for this job. Usually the roof structure can be assembled complete on the ground and just needs to be lifted up and held at height so the wall poles can be connected to it. While most manufactures demonstrate placing the main cover when the structure is complete. An alternative to this is to set out the main cover on top of the roof structure on the ground before attaching the wall poles, lift everything up and connect wall poles. This will require 3 – 4 people. The advantage of doing it this way is it will be easy to line up the fabric perfectly with the roof structure which can be difficult to do when your shed is erected. There is also a less likely chance of damaging the cover this way by pulling or stretching it. The usual run of the mill is to secure front and back doors of your shelter before fasting down the main cover. Take a little time with the doors to make sure they are properly lined up with seams seated correctly. Finally you will need to anchor your shelter into the earth or to the concrete. There are various methods for doing this. Most common are the augur anchors that simply screw down into the earth almost like a corkscrew. You can use a bar through the eye of the augur to gain more leverage to tighten it all the way down into the earth. When properly fitted these provide really secure anchor points to ratchet down your structure to. Congratulations if you got this far, well done… You are now an expert of assembling a portable shelter and will be able to advise all your friends on how to build theirs. Storage Sheds Direct are main authorized agents for Rhino Shelters and Shelter Logic portable shelters. We ship factory direct often with huge savings of up to 40% which we like to pass on to our customers. 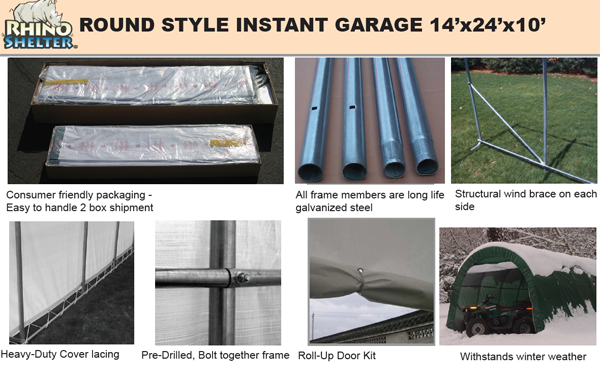 Order your portable shelter now to avoid delays and get covered for winter. Call us free on 1 800 419 7739 for reliable and helpful customer service. Very informative and thanks for posting. I really enjoy reading about the different types of sheds available.